Mrs Brown's Thoughts: Who's job is it to clean the toilet? In our house in an attempt to appease Mr B we have agreed on a Saturday cleaning schedule. I know we are just 'so rock & roll'. This just means we will get through all the boring house chores & get the flat ship shape on a saturday. So as it's Saturday I get up and as hubby is visiting his gran, I decide I must get started on the cleaning. When I do something I have got to do it 'right'. Enter the black & white thinking. So perfectionist me set about cleaning. So the usual dusting, hoovering and cleaning got done but me being me went that little bit further so out came the tooth brush. 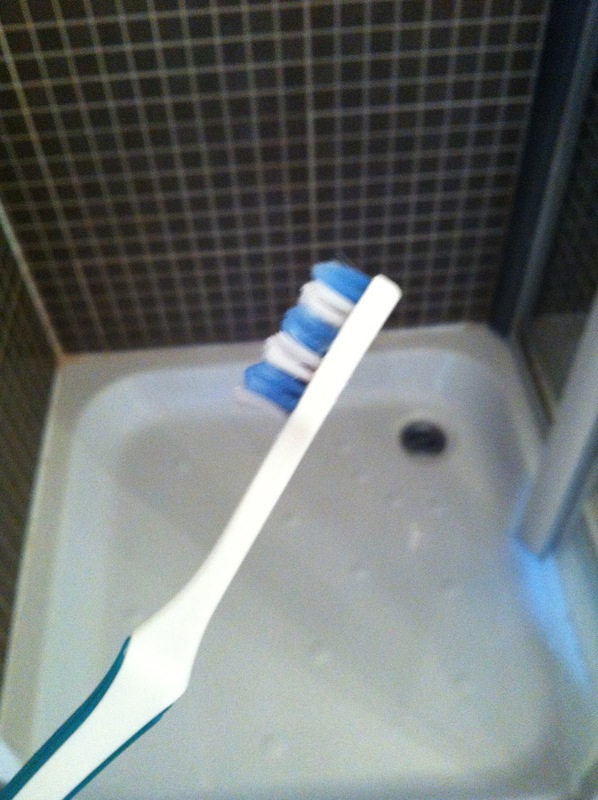 So our shower has now been scrubbed with a toothbrush. Every little nock & cranny was cleaned. Behind the loo, behind the sink, on top of the medicine cabinet - I even took the hoover to the extraction fan to clear that out of fluff. Anyways I won't detail every cleaning task, that would just be boring. After hours of cleaning, what did said hubby do on his return home? He went out with the dog. Now this is not about my hubby not pulling his weight, in fact he is the one that does most of the housework & generally just keeps us ticking over! I am so lucky to have him & he is very supportive. But I found myself just slipping into a role, into a job that quite frankly I don't really want. Yet I find myself doing it to the best of my ability. I sunk my heart & sole into scrubbing & hoovering. So I ask what is your job? I used to define myself by my job. I was a dietitian. That meant (in my mind) I worked hard for the NHS, I lived & breathed medicine & patient care. Outside of work all my friends were dietitians, my reading was dietetic journals, my spare time was building my portfolio & my thoughts were filled with food. It also brought with it a whole lot of inadequacy issues about my weight & health but that is a whole other post! I know it's not healthy to be defined by your job. I know there is more to me as a person, but what is this something more? I have had two episodes of long term sickness in the past 3 years. That alone should tell me something. Luckily I am beginning to think it has. I look at that previous paragraph & note that I have written I "was" a dietitian. I still am. I am fully qualified, my knowledge is up to date, and I am back at work. Something has most definitely changed though. I am now part time, I am going home on time, I have friends who don't even work in the NHS never mind dietetics! And I have time and space to add cleaning the toilet to my list of jobs. There is now room to breathe in my mind and that feels good, even if it does mean spending time pondering who's turn it is to clean the loo! Wow a deep & meaningful post sprung from a crazy cleaning day.